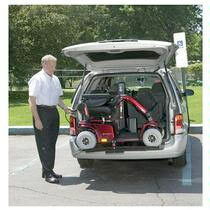 The Backpacker Plus unit holds your scooter or power wheelchair inside your vehicle for safe keeping, and easily mounts to the existing floor latches when the rear seat is removed, so there are no holes to drill or modifications to your vehicle. And the battery pack option means you don't have to wire it to your car battery either. Just pop it in and go! The fully automatic single button lift operation means there is no work on your part...the lift moves outward, lowers to the ground, then moves up and into the vehicle entirely on its own. Fits in most mini-vans. Please note that if you have one of the newer mini-vans with the third seat that folds into the floor, the Backpacker can still work with no drilling. It will require a modification kit that we can provide at no charge when you order the unit. Automatic loading into cargo area of your vehicle. Attache with existing third-row seat hardware...no drilling! No permanent installation of unit...easily installed in another vehicle. Separation between existing floor couplings can be a maximum of 45". Inside edge of door sill to outside edge of bumper can be a maximum of 13"
"Drop" from bottom edge of door to floor of vehicle can be a maximum of 4". Inside edge of door sill to middle seats must be at least 42". Please call to check compatibility with your vehicle. Platform size 27" x 47". Can also be bolted to the floor for a permanent installation. Base lift weight: 183 lbs. Maximum Scooter or power chair width: 26"
Maximum travel distance from floor to ground: 26"
Motor: 12 volt on-board battery pack (110 volt charger included). Platform: Full steel powder coated platform. For three (3) years from the date of purchase, Pride Mobility Products will repair or replace at their option, free of charge, any mechanical or electrical component found upon examination by an authorized represantative of Pride to be defective in material and/or workmanship.